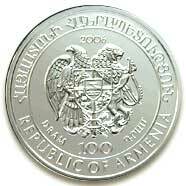 This is the first 1-oz Silver Coin, from a set of 12, that the Central Bank of Armenia has issued to depict the endangered animals of Armenia. File:240px-Igel01.jpg A hedgehog is any of a wide variety of small quilled mammals of the order Insectivora found through parts of Europe, Asia, Africa, and New Zealand. There are no hedgehogs native to The Americas. Hedgehogs are most closely related to gymnures, also to other insectivora such as moles, shrews, tenrecs and solenodons. 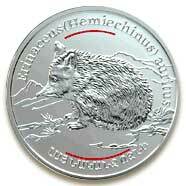 A hedgehog's primary defense is to roll into a tight ball, causing all of the quills to protrude outward. They also make loud huffing and popping noises. This is an effective defense against most predators. As a result, hedgehogs have few natural predators, primarily birds (especially owls), and ferrets. Wild hedgehogs are sometimes killed by humans, particularly by road vehicles. Hedgehogs occasionally perform a ritual called 'anointing'. When the animal comes across a new scent, it will lick and bite the source and then form a scented froth in its mouth and paste it on its quills with its tongue. This camouflages the hedgehog with the new scent of the area and provides a possible poison or source of infection to any predator that gets poked by their quills. Hedgehogs are primarily nocturnal and feed on snails, worms, and insects. In areas that have hedgehogs in the wild, they are often welcome as a natural form of garden pest control. Many people leave food out to attract hedgehogs. However, hedgehogs are lactose intolerant and will eagerly eat cheese products and drink milk, making themselves sick. Dog and cat food is a better food than dairy, but it is often too high in fat and too low in protein. It is best to leave out only a small treat, leaving them plenty of appetite for the pests in your garden. Depending on the species, the gestation period is 40-58 days. The average litter is 3-4 newborns. Larger species of hedgehogs live 4-7 years in the wild (some have been recorded up to 16 years). Smaller species live 2-4 years (4-7 in captivity). Rare type. The number is decreasing. In the southern parts of Armenia, ranging from Megri to Talin. Part of the natural habitat is covered by Khosrov Nature Reserve. This page was last edited on 13 April 2012, at 04:46.